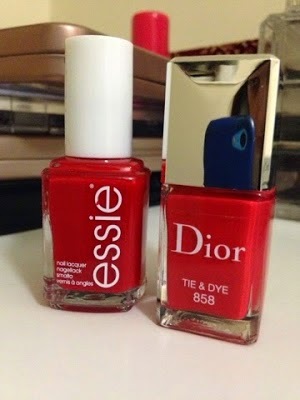 Nail Lacquer Dior Tie & Dye 858: Worth the Splurge? I know what you are thinking: a girl talking about fashion, hair styling and make up; typical. I also know that the "blogging world" is very saturated, with a lot of bloggers out there just trying to find a niche to fit in. BUT what I know is that for a very long time I've been wanting to put myself out there and share a little bit of what I have learned and my opinions and write about stuff I really care about, aka beauty! So I hope from the bottom of my heart you truly like what I have to say in this not-so-secret diary of mine and that you come back to check out all the great ideas I have in store, Stay Tuned! So, enough about me... today I wanted to bring you my first review of a product I am simply in love with, not just because it was a gift from my wonderful fiancée ❤, but also because it is so beautiful I may cry (ok, drama over). Magical, beautiful, traffic-stopping, the perfect-red-summer colour: these are just a few adjectives I could think of to describe this divine nail polish- oh there is another one. Really easy application and great coverage with just one coat + it dries very quickly, what else could you want! It gives your nails a lasting shine and even with two coats, the nail polish doesn't look too thick (or too thin); it's perfectly sleek. But (there always is a but), the only no-no for me was the durability of this product, even when I used a top coat. My expectations were very high given this is a DIOR nail polish after all. Yes the colour is perfection and all that, but sadly it lasted exactly 2 days until it first chipped and then, we went downhill from there, *cries". Maybe it's just me?! Apart from this tiny detail, just take a look at the beautiful bag it came in, pure glam! Did a little research and the price is a little higher than what I would usually pay on nail varnish. It can be yours for £17.50 and can be purchased here. Truth is, if you want to invest , have gorgeous looking nails and receive lots of compliments on your nails like I do everytime I have it on, do it, treat yourself! But if you are like me and wants to save money money, (because it doesn't grow on trees and it doesn't fall from the sky, and quite frankly would rather spend it in clothes, make up, jewels,etc Ha! ), I have found the perfect dupe. It is less than half of the price compared to Dior, chip-free for about a week and looks just as beautiful, here it is. You are welcome! Tell me, have you tried any of these? I would love to hear from you! Leave your comments, links, reviews and anything else below! This is all I have for today girlies! See you all soon and don't forget to follow me!